CRUX the Southern Cross may be a small constellation, but it certainly is spectacular! Astronomers and stargazers around the world often consider Crux one of the most wonderful constellations due to its brightness and many cosmic objects. The constellation Centaurus surrounds Crux in the west, north, and east; Musca is south of Crux. 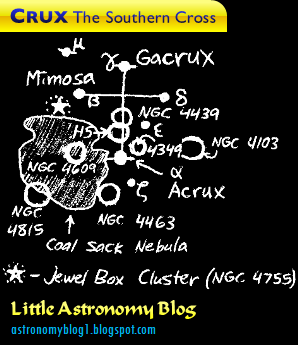 The Coal Sack Nebula is by far the largest remarkable object in Crux. Extending into Centaurus and Musca, the Coal Sack Nebula is famous for its dark black appearance amid star-studded surroundings. 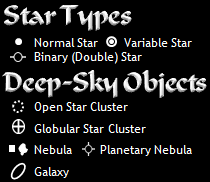 The Jewel Box Cluster (4755 in the New General Catalog) is truly a cosmic gem, possessing a colorful variety of stars as an open star cluster. Crux is an important cultural element; for example, it is featured on the flags of Australia, Brazil, New Guinea, Papua New Guinea, and Samoa. All yellow links above open up to images from the Students for the Exploration and Development of Space (SEDS).